Jack Roush used to rule the track, but things have changed. Jimmie Johnson said today the groove is only one car wide around the entire track and it is going to be tough to pass for the Sprint Cup Series cars. The race may well be won on pit road or a restart. Nicole Briscoe has Rusty Wallace, Brad Daugherty and Ray Evernham with her in the Infield Pit Studio today. Allen Bestwick will call the race with Dale Jarrett and Andy Petree alongside. Mike Massaro, Dave Burns, Vince Welch and Dr. Jerry Punch will handle pit road. Tim Brewer will watch from home. ESPN has a big challenge. Once the field stretches out, the coverage has to find a direction and a theme. It can't be in-car cameras and tight shots. ESPN is going to have to work to tell the stories, recap the standings and tell lots of stories to fill these four hours. The good news is that the announcing team is up to the challenge. The bad news is that the production truck continues to make one bad decision after another. No aerial shots or wide angles, few updates on drivers not in the top ten and no follow-up on drivers working their way back through the field. Goodyear says there are no tire problems, so the only issues we should see may be engine related. There are eight start and park teams in the race today, so the actual competition for the win should come down to the usual suspects. The weather is good and even though Ryan Newman is reported to be under the weather, he has confirmed he will start the race and intends to see it all the way through. We are going to be on Twitter with our live stream of TV/media comments on today's telecast. Please take a moment to join Twitter and see what all the fuss is about. We have drivers, teams, media and NASCAR officials all contributing to this live stream. Just type #TDP1 in the search box to see our conversation live and continually updated. Add #TDP1 to the end of your tweets to automatically be included. There will be a post on this page when the event is over for your comments. Thanks to all of you for your patience while I was on vacation this week, looking forward to seeing how ESPN will handle this challenge today. 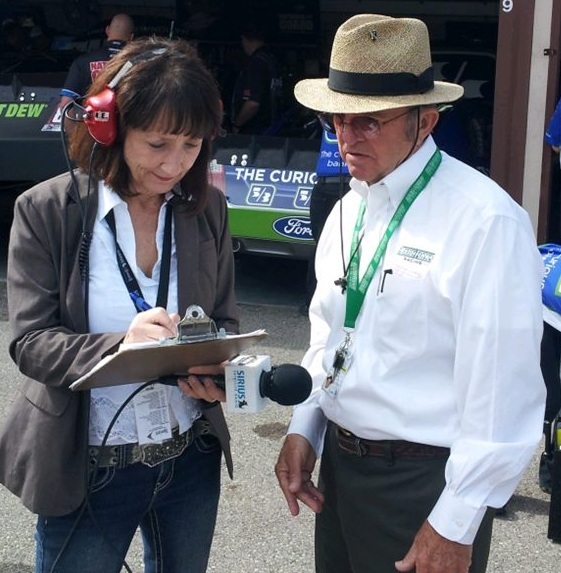 Thanks to Roush PR for the picture at the top of the post. The conversation ESPN is having about picking guys who will make the Chase is a pretty clear idea that they DO pick favorites. That anyone can write a Kyle Busch or a Jeff Gordon off already with 4 races to go is ridiculous. Now Rusty questions Jeff as a garage presence to his team? Ummm, anyone think Rusty is still mad about Bristol? What happened to giving us some stats and just letting the race play out? Hey JD can you tell me what that previous Jeff gordon piece was?I missed it.I heard he channeled his inner Kurt Busch! Lol I'm watching Jr's Race Buddy view and i'm getting his on board view but i'm getting JPM's audio! Cloudy day here, so the Michigan race is on. RaceBuddy is useless, both mosaics have 3 in-car cameras and 1 useful camera. What a waste of an opportunity. Who's in charge of RaceBuddy? Some of the video doesn't match the audio. The 88 video has the 42's audio. And I'm seeing there are others that don't match. How is it that nobody checked this before it went live? Turned on Race Buddy after the first yellow and jumped on board the 48 to see Jimmie come through the field. But that’s not going to happen the way Race Buddy is working today, again. I watched the 18 get loose in turn 3 twice, the race buddy is jumping backwards again making the viewing useless. Back to the live NHRA webcast. After one whole fuel cycle, David Stremme, Joe Nemechek, Casey Mears and Dave Blaney have parked and joined the other 5 in the garage. 9 S&Ps in total. I missed Mears in my S&P list Friday. Without going into specifics,i can say Race Buddy has hit an all time low.Anybody been watching it?Can somebody baragge Directv with phone calls please?Just remarkably frustarting to watch. It's amazing what ESPN will catch when they follow the best racing. This is one hell off a race!!! I'm loving this race, things are actually happening! It's not drivers riding around in circles with the announcers filling air time for 3 hours.